The Fokker Dr 1 was designed in response to the British Sopwith Triplane which had proven to outperform all existing German fighters in service on the Western Front. The Fokker Dr 1 was a very manoeuvrable and agile dogfighter, the "Dr" was an abbreviation of "Dreidecker" meaning 3 wings, it is now better known by most people as the Fokker Triplane. Manfred Von Richthofen (the Red Baron) is reported to have said "It climbed like a monkey and manoeuvred like the devil" following his first test flight of the "Dreidecker". The initial production aircraft suffered from structural wing failures resulting in the loss of both aircraft and pilots, the aircraft was was withdrawn from service while the design and building methods were rectified, by the time modifications had been implemented the new improved performance Fokker DVII biplane had already entered service making the Fokker Triplane effectively obsolete. Fokker's Anthony Herman Gerald was ordered to produce 320 Fokker Dr 1's on the 14th of July 1917, the first production aircraft was personally delivered by Tony Fokker to Manfred Von Richthofen "The Red Baron" and the DR.1 entered operational service on the 'Western Front' in the following month with Richthofen's infamous Flying Circus "Jasta 11". Manfred Von Richthofen (the Red Baron) was destined to make this steel tube airframe dogfighter famous although in less skilful hands it was to prove hard to control (most successful dogfighters have unstable flight characteristics and require a highly skilled pilot to keep them in control). Manfred Von Richthofen (the infamous Red Baron) is reported to have said of the Fokker DR1 Triplane "It climbed like a monkey and manoeuvred like the devil" following his first test flight of the "Dreidecker". 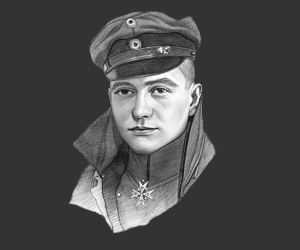 Manfred von Richthofen "The Red Baron" was fatally injured on the the 21st of April 1918 whilst flying his red Fokker DR1 Triplane by a chest wound which caused heart and lung damage, he lived just long enough to land his aircraft behind the Australian lines. An Australian Medical Corps Sergeant who went to the stricken Barons aid reported that the last word he spoke was “kaputt”. These pictures of a Fokker DR1 Triplane are Copyright © June 2014 Siteseen Ltd. We only authorise non-commercial picture use and particularly encourage their use for educational purposes. This Fokker DR1 Triplane picture is not in the Public Domain. 3) Use of this Fokker DR1 Triplane picture, or any of our pictures on websites re-distributing copyright free material is strictly prohibited.